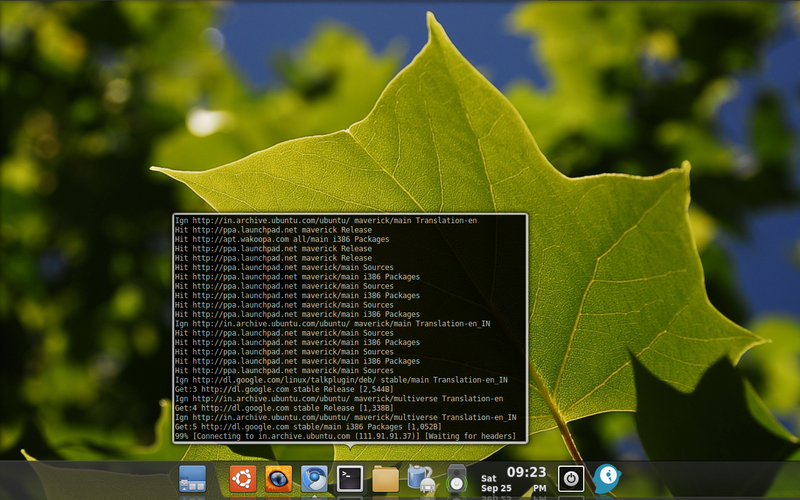 Avant Window Navigator(AWN) is an awesome dock application for Linux. 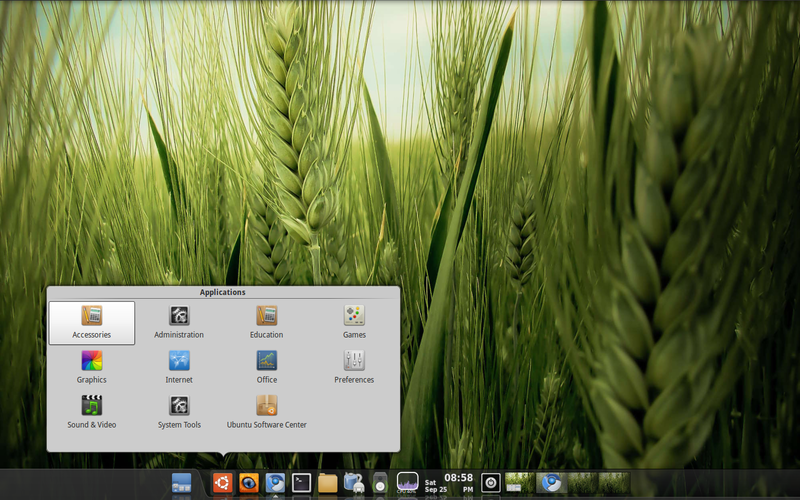 Over the years, AWN has evolved a lot and is now the almost-perfect dock application for Ubuntu/Linux users. AWN Lucido started of as an experimental branch of AWN and is now integrated into AWN stable and is now available through AWN trunk PPA. The way this dock application occupies the complete bottom panel of your desktop is an absolute delight to watch. Everything about AWN is so eyecandy. 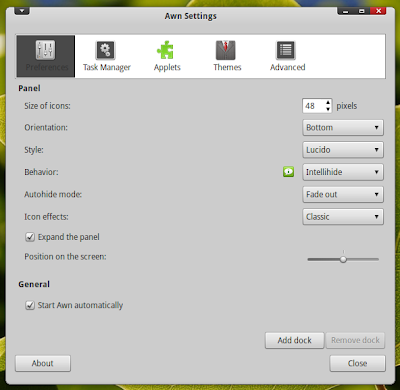 Above screenshot is actually the basic AWN settings menu. It is so useful and fun to use at the same time. 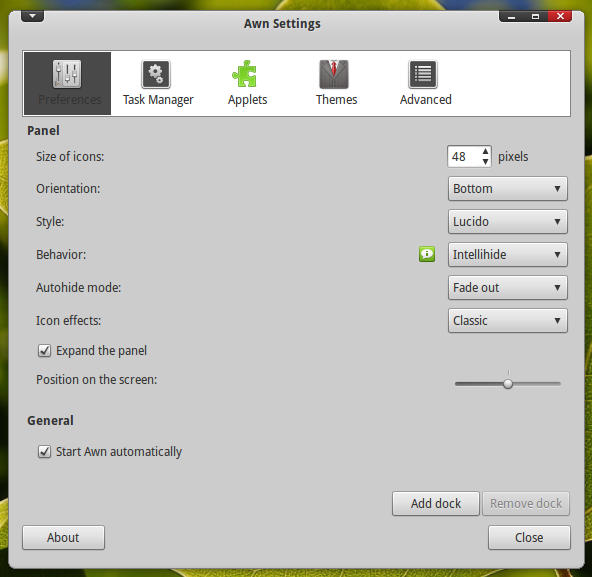 Above is the intuitive AWN menu settings. Adding and removing applets from AWN is so easy and quite a number of applets are available as well. You could even add launchers of your favorite application to AWN. 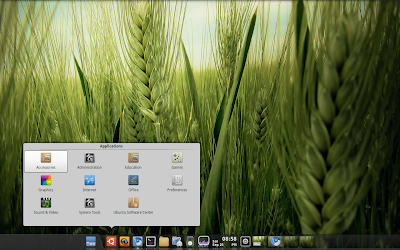 How to Install AWN Lucido in Ubuntu Lucid, Maverick? As we said earlier, AWN Lucido is now merged with AWN trunk PPA. Do the following in Terminal to intstall AWN Lucido in Ubuntu Maverick, Lucid. Done. For the time being, I have stopped using panels and going to rely on AWN only. As of now, I am more than satisfied. Here is my desktop with AWN on. Give it a try and let us know how it went. On a last note, I have to warn you yet again that, though the steps provided here should work fine for both Ubuntu Lucid and Maverick, I have tried this only on Ubuntu Maverick Beta.